Lighting Designer Steve Bewley was asked to light indie blues rock band Palace’s recent showcase gig at the Electric Brixton, London. He chose to use a Robe floor package that was supplied by Dragonfly Lighting. Bewley chose eight Robe Spikies, eight LEDWash 300’s and eight CycFX 8’s, combined with elements of the Electric Brixton overhead house rig. 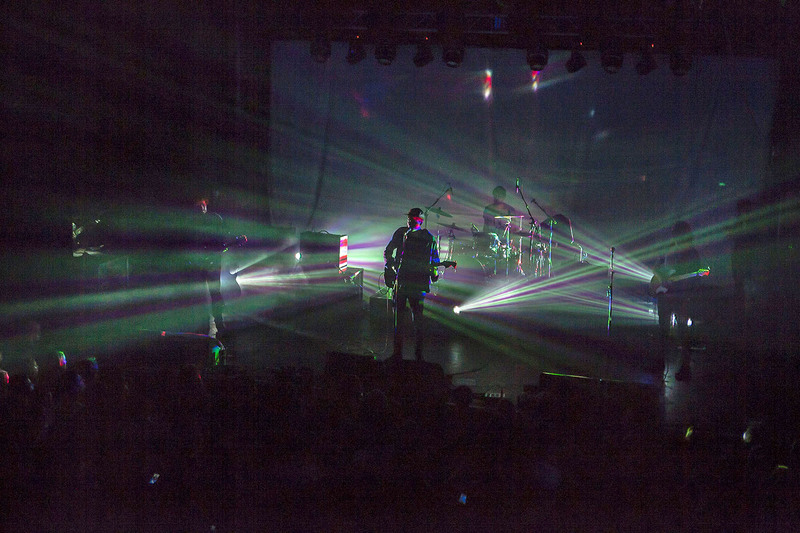 His design also included projections from the FOH over the band and onto a backdrop. He worked on this and the video content creation with Chris Jablonski of Tawbox. Bewley could create big fields of light and combine them with different Spikie beam looks and effects from the back, with the Spikies being a recent purchase by Tom Mason at Dragonfly. The prism effect was used to slice through the projections, while the Spikies were neatly tucked away around the sides and back of the risers, keeping them hidden from view but highly visible in effect. The LEDWash 300’s were utilised for side light, contrasted with larger pools of light, and were also used for silhouetting. CycFX 8’s were at the back of the stage, but by using the zoom, Bewley could bring them in as powerful backlighting or use them to create effects. Palace are scheduled to be engaging in more live work throughout 2017.